I never even had a cheese straw until I moved to the south, but I quickly learned that they are awesome. This recipe has been developed over the years to become my go-to snack in the car. My wife doesn’t eat them, so I can do things like add a bunch of Sriracha! Or if you really want to have fun, take one tablespoon of butter away an add one tablespoon of bacon or beef fat. If comes through great in the end. Mix it up and choose your own cheese straw for your next adventure! Push out through a cookie press into desired shapes and lengths onto a greased cookie sheet. Bake at 300° for 20-30 until tops just start to brown. (You may want to check the bottoms around the 25 minute mark. If they are getting too brown, move them to the top rack of the oven.) I refrigerate these and they are still good six weeks later. 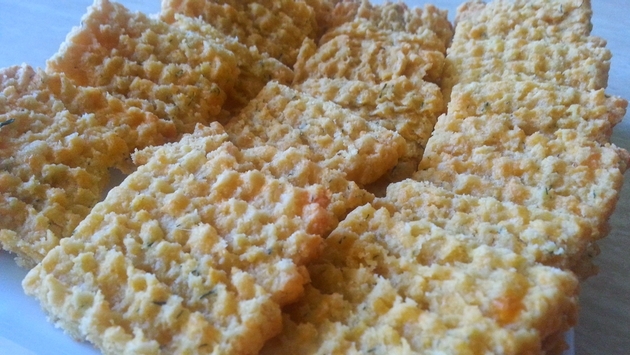 You can also roll out the dough thinly and cut into strips or circles to make crackers. I like to make the basic recipe, keep the crackers a little thicker, and then top with bacon, spinach and a dab of sour cream for a great appetizer.